The Pueblo of Tesuque (te-su-ceh) is one of the Eight Northern New Mexico Pueblos. It is only 20 minutes travel time from Casa Escondida Bed & Breakfast, a Santa Fe area bed & Breakfast, which is located in historic Chimayo, NM (just 35 minutes north of Santa Fe, on the High Road). Tesuque Pueblo, which means the “Cottonwood Tree Place” is open to the public. Their pueblo artwork has been handed down from generation to generation. While the majority of the tribal members make pueblo pottery and paint, some of the pueblo people are also very well-known embroiders and sculptors. You will likely to recognize their distinctive “rain gods”, which are small, seated figurines holding children, animals and pots, etc. on their lap. Their rain gods represent the longest continuous figurative art tradition in the Southwest. The Tesuque Pueblo hosts various “feast days” throughout the year. The next feast day is on November 12th, 2012. The Tesuque Pueblo will celebrate their annual San Diego Feast Day (photography is prohibited) at their Indian Pueblo Cultural Center. You are invited to this New Mexico event! A feast day will provide the most intimate glimpse of Peublo religion and culture. These special days celebrate the Pueblos’ traditional religious calendar. They consist of religious dances that represent nature, animals and agricultural cycles. The dances are not shows but expressions of ancient religious beliefs. During your Santa Fe vacation, you can also visit The Tesuque Pueblo Flea Market (next to the Santa Fe Opera House). The Tesuque Pueblo Flea Market (open March – December) is a shoppers dream. It is a favorite with the locals too! Keep the flea market in mind for picking-up some beautiful and unique items for your holiday gift-giving needs. 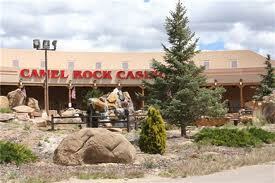 Tesuque Pueblo also operates the Camel Rock Casino. Casa Escondida Bed & Breakfast has delightful rooms available throughout the year. Come shop, dine, test your luck, take in a traditional Native American Indian Feast Day and more! The staff at Casa Escondida Bed & Breakfast looks forward to your visit. Remember that 4 of our 8 guest rooms are pet-friendly. Feel free to bring you furry, best friend with you for your New Mexico trip.